Many Exaile users like Ex Falso, which is one of the most comprehensive tag editors in the GTK+ land. 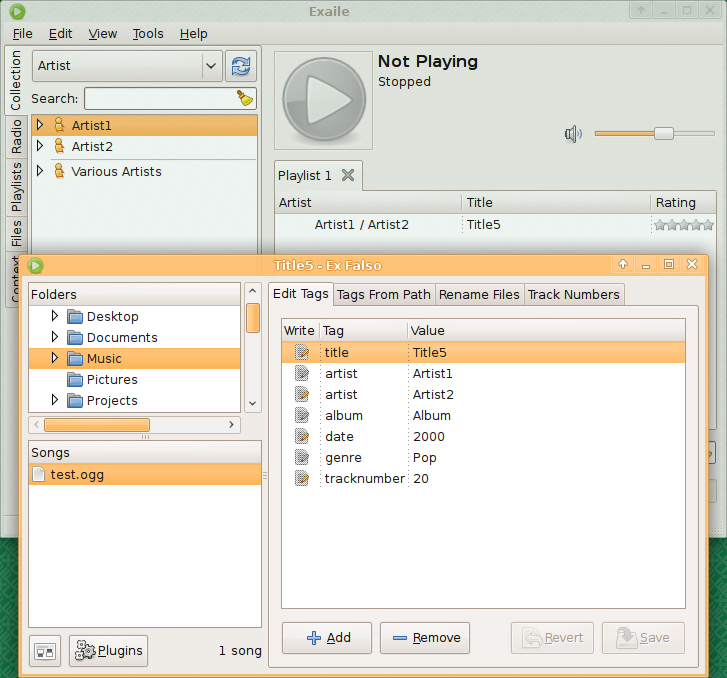 In fact, the tag editor in Exaile 0.2.x (developed by Ville Lindholm as part of Kesäkoodi 2007) was made to resemble it. This tag editor unfortunately did not make the transition to 0.3.0, which was released with a very simplistic tag editor. For 0.3.1, Aren plans to have a tag editor that is as powerful as—but less complicated than—Ex Falso and the old tagger. The discussion in #exaile piqued my interest, and I decided to start working on a plugin that lets Exaile use Ex Falso as its tag editor, an idea that has been discussed several times before. It seems to work quite well now. There were a few things I needed that Ex Falso’s standard API wasn’t designed to do, but they weren’t hard to work around. This entry was posted in All and tagged exaile on 2009-09-25 by Johannes Sasongko.